A recruiting platform that works around the clock to attract and convert qualified candidates to your job requisitions, and opens up doors to generating new sales leads and revenue streams. You need to attract a steady stream of qualified candidates and find new customers while maintaining privacy and security. Yet as a search firm, you’re forced to keep up with fast-paced changes in technology and a highly competitive marketplace. My database is my business. 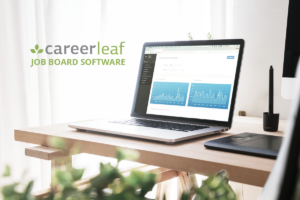 Is a Careerleaf-powered job board secure? Unlike other SaaS providers, Careerleaf is dedicated to making sure your data remains yours in a secure and private database. Your data is your own. How can I market my jobs to candidates? Careerleaf’s integrated content management system makes it easy to blog and create branded, SEO-friendly content that attracts candidates, and supports add-ons to marketing and automation tools. You can also generate outbound XML feeds from Careerleaf-powered job boards so you can distribute your jobs to aggregators, social media, other job boards, and paid job distribution services. Can I use my job board for lead generation/marketing to employers? Yes. Your job board is a great place to find new customers and upsell them from job postings to your recruiting services, helping you develop a broader customer base. Can a Careerleaf-powered job board also work as an ATS? Yes. Careerleaf offers candidate search and recruiting tools for screening, short-listing, and managing candidate pools on your job orders. If you’re thinking about adding a powerful hybrid job board and ATS that makes lead generation and marketing to candidates easy, or you want to switch to a newer, better solution, get in touch with us. You can request more information, a personalized demo, or have us call you for a quick chat.